We are incredibly proud of our students and their accomplishments! We invite you to peruse the archive on the right for a closer look at the amazing academic, athletic and artistic achievements of our students throughout the years. We announce the Award Winners of the 29th Annual “Monterey County History Day – Triumph & Tragedy in History.” Students from several Monterey County schools competed at Monterey County History Day, held at Los Arboles in Marina on Saturday, March 9, 2019. The 7th grade All Saints’ students won a total of 16 special awards and six students were County Winners and will continue to National History Day – California. The NHD-CA State Finals will take place in Rocklin, California on May 10-12, 2019 (http://www.nhdca.org/). Congratulations to our 8th graders! They successfully competed at the Monterey County Science & Engineering Fair on March 16, 2019 and returned with impressive results. Yesterday, they shared their projects at chapel and impressed the community with their research topics! We are incredibly proud of our students and all their achievements. 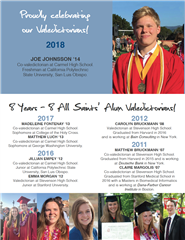 Once again this year, we are able to celebrate the academic achievements of one of our alumni who was co-valedictorian at Carmel High School. Congrats, Joe! “Rioting for Reform: The 1971 Attica Prison Riot Conflict & Compromise in Prison Reform” in the individual junior documentary category. Sam will represent the state of California and All Saints’ Day School in Maryland June 10-14, 2018, at the National History Day Competition at the University of Maryland, College Park. “The 442nd Regimental Combat Team: Fighting Injustice and the Enemy” in the individual junior historical paper category. He also received a special award from the Japanese American National Museum. “The Norwegian Resistance during WWII” in the individual junior website division. He was also awarded the European History Award. Fellow All Saints’ students Alex-Gianola Cook and Jim Moreau were also finalists. The 7th grade All Saints’ students won a total of 24 special awards and eight students were County Winners and will continue to National History Day – California. The NHD-CA State Finals will take place in Rocklin, California on May 5-6, 2018 (http://www.nhdca.org/). On Sunday, April 22, French language middle and high school students took part in the Concours de Poësie, hosted by the Alliance Française, at the Middleberry Institute of Monterey. The event started with recitals of famous French poems and concluded with the presentation of original poems.Students received awards for their own original compositions after being judged by a panel consisting of members of the Alliance Française and faculty of the Middleberry Institute. All Saints' students did a fabulous job and won a total of five awards. Hannah Filly, Kate Morgan, Cailin Templeman, and Julia Vanoli represent All Saints’ and Monterey County at the California State Science Fair on April 23-24, 2018 in Los Angeles. Dylan is the All Saints' Spelling Bee Champion and represented All Saints' at the 2018 Monterey Countywide Spelling Bee on Sunday, March 4 at Hartnell College. Dylan's winning word was severely. Eight of our students competed at the MathCounts competition in Monterey on March 10. Cailin Templeman and Craig Chiu finished in the top twelve and proceeded to the Countdown Round where Craig finished in 3rd place. Craig Chiu also won third place in the overall individual category and represented All Saints' at the State MathCounts competition at Stanford on Saturday, March 31. Cailin Templeman won a silver key award in the journalism category from the Scholastic Art & Writing Awards competition for her "Names Becoming Numbers" essay on Japanese Internment. Click here for her essay. 6th grader, Isabella Jackson won the 2018 Cowboy Poetry Contest in her age group. She recited his poem at the Cowboy Music & Poetry Gathering on March 16, 2018, at the Fox Theater in Salinas. Austin Cook '20 and Ansam Qureshi '20 received Honorable Mention awards. Their poems are also published on the Monterey County Free Libraries website. This annual event is sponsored by the Foundation for Monterey County Free Libraries and the California Rodeo Salinas. Please follow this link to read their poems. 2017. His poem is also published on the Monterey County Free Libraries website. National Spanish Exam and National French Contest. They scored 13 GOLD medals, 19 SILVER medals, 7 BRONZE medals, and 6 Honorable Mentions! Our 11 County winners went to Rocklin to represent All Saints' and Monterey County. On Saturday, March 25, 2017, the Alliance Française of Monterey and the Middlebury Institute of International Studies hosted the Concours de Poésie 2017 in which students from local school recited famous french poems as well as presented their own. Our middle school French students did a fabulous job and Adam Chaabane '17, Logan Falkel '18, Amalie Hansch '18, and Cailin Templeman '18 won Honorable Mentions, Elisabeth Hansch '17 and Gabrielle Schmidt '17 won 2nd place awards, and William Langmann '17 won 1st place for their original poems. The 1st place winners will represent All Saints’ and Monterey County at the California State Science Fair on April 24-25, 2017 in Los Angeles. Heidi Hansch '17 placed in third place after correctly spelling surrealist, adequacy, summitry, redact, beacon, halal, dossier, serdab, commissar, lieutenant, streusel, shogun, finale, and nonsense in the 2017 Monterey County Spelling Bee on Sunday, March 5. 57 Monterey County students competed during the longest Monterey County Spelling Bee in its history with 17 rounds, before crowning a new champion. DAR (Daughters of the American Revolution) American History Essay Contest. William Langmann's '17 essay was selected as the DAR Monterey Chapter 8th grade essay winner. This contest is open to all 5th through 8th grade students in public, private, and parochial schools, and registered home-study programs. Each year a topic is announced, and contest instructions are published online and sent to schools by participating DAR chapters. Essays are judged for historical accuracy, adherence to the topic, organization of materials, interest, originality, spelling, grammar, punctuation, and neatness. This year's All Saints' participants, eighth graders Tyler Bianchi, Tristan Guenther, Heidi Hansch, William Langmann, Broden Murray, and Kate Popky and seventh grader Clea Caddell, competed against 66 other students from 11 area schools. Broden, Clea, Heidi, and William's team earned first place and they will represent All Saints' at Stanford at the state competition on March 18, 2017. Additionally, Broden and Clea placed in the top 10 individually. Clea Caddell '18 just received her award for finishing in 1st place at the Math League Championship. Broden Murray ‘17 was a winner at the 2016 Cowboy Poetry Contest. Sophia Kastros '20, Caitlin Reiss '22 , and Gabrielle Schmidt '17 finished in 1st place for their entries to the Carmel Valley Art Contest. Clea Caddell tied for the number one spot in the entire league with a perfect score. The All Saints’ 7th grade class scored in the top one third of all schools in California. Participants: Clea Caddell (6th grade), Josefina Camacho, Grace Deakyne, India Gonzales, Mia Kotelec, Broden Murray (7th grade) Lauren Rice, Gwyneth Rider. Clea Caddell, Broden Murray and Josefina Camacho scored in the top 25% of individuals. The All Saints’ Team placed 5th. In December, Middle School students entered a nationwide poetry contest through an organization called Creative Communication. The organization picks winners from the thousands of entries they receive, and select a variety of poems to be included in an anthology they publish, A Celebration of Poets. 13 students from our Middle School were selected to have their poems included in the anthology, A Celebration of Poets. Congratulations to Clea Caddell, Craig Chiu, Logan Falkel, John Hoffman, Teah LeBlanc, Christopher Miller, Ivor Myers, Kensington Nelson, Alexander Rupp, Julia Vanoli, Finnian Vogelpohl, and Chase Weiss. J.T. Byrne finished in 5th place in the Individual Junior Documentary division with his documentary "Exchanging Baseball Diamonds for Sandlots: How Baseball "Saved" Japanese American Internees"
Performance Arts Award - Pac Rep.
"How Does the Packaging of Beverages Affect Consumer Taste Preference?" Grace & LiMei were invited to compete in the Broadcom Masters science competition and will represent All Saints' and Monterey County at the California State Science Fair in May. "Do Different Types of Red Flowers Contain Different Pigments?" Josefina was invited to compete in the Broadcom Masters science competition and will represent All Saints' and Monterey County at the California State Science Fair in May. "How Do Different Lighting Environments Affect Yeast Fermentation?" Lauren was invited to compete in the Broadcom Masters science competition. "How Does Age Affect the Perception of Time?" "Are People Wearing Glasses Perceived as More Intelligent?" "Water Purification Methods for Treating Water." "How Does the Wavelength of Light Affect Plant Growth?" The All Saints' Middle School boys basketball team, coached by Coach Mark Giangiorgi, are the 2016 MTJAL League Basketball Champions. They defeated Pacific Grove Middle School in the Championship game at San Benancio Middle School. Clea Caddell '18 won the All Saints' Spelling Bee on February 9. 2016 and will represent All Saints' at the 2016 Monterey Countywide Spelling Bee on Sunday, March 13 at Hartnell College. Seventh Graders Grace Deakyne '16 and Matthew Galloway '16 represented All Saints' at the annual Steinbeck Essay Contest and both are now published authors! Grace won first place of all 7th grade participants. "Does Age affect Human Reaction Time?" Grace will represent Monterey County and All Saints' at the California State Science Fair in May in Los Angeles. Grace also was nominated to compete in the Broadcom Masters competition. "How do different fruit-based Compost Solutions affect the Growth of a Radish Plant?" Bella and Caitlyn will represent Monterey County and All Saints' at the California State Science Fair in May in Los Angeles. They were nominated to compete in the Broadcom Masters competition, received $150 award from the Monterey County Agriculture Association and $100 from the Northern California Institute of Food Technology. "How do the Mass and Height of Dominos and the Distance between them Affect the Speed at which they fall?" "Are Physical Flashcards more effective for Memorization than Online Flashcards?" "Fresh or Salt? Which produces more Electricity in a Microbial Fuel Cell?" "How does Wheel Hardness affect the Speed of a Longboard?" "Does the Inflation of a Soccer Ball affect the Distance it travels?" "How does Age Affect the Credibility of an Eyewitness?" "Does Batting with one Eye Open vs. Two Eyes Open affect how well you hit a Baseball?" Our County History Day Winners went to Riverside to the History Day State competition and did a fantastic job representing our school! India Gonzales '16 was a finalist in the website category and Matthew Galloway '16 was a finalist in the exhibit category. 6th grader Nina Harmer won the Monterey County Spelling Bee in March and will represent Monterey County and All Saints' at the National Spelling Bee in Washingston. DC in May. The Middle School Spanish students won 17 medals total: 6 gold medals, 8 silver medals and 3 bronze medals! Congratulations and we could not be prouder of all of you! In February, the middle school French students participated in the National French Exams. The exams were extremely competitive, with only 5 percentage points separating the Gold, Silver and Bronze medal winners. Congratulations to all our French students on a great job! Seventh graders Minnie Mills and Katherine Hewitt represented All Saints' Day School at the Steinbeck Young Author Program Day Contest this year and both students were winners! Of all of the seventh grade participants in the essay contest, Minnie earned second place overall and Katherine's essay received the "Judges Award." Minnie's and Katherine's essays have been included in the Gablian Journal, a collection of the essays written by participating students. "How does the temperature of a baseball affect the distance it goes when bounced off a wall?" Carson & Christian will represent Monterye County and All Saints' at the California State Science Fair in LA. "How do classic boy and girl stereotypes affect boys and girls today?" "Variables affecting evaporation of water." Billy and Jackson will represent Monterey County and All Saints' at the California State Science Fair in LA. "How do the size of the magnets in a guitar pickup affect the pitch of the guitar?" "How does head-first sliding vs. feet-first sliding affect the time to reach the next base?" "How do different fertilizers affect the growth of sweet pea plants?" Grace and Olivia will represent Monterey County and All Saints' at the California State Science Fair in LA. "Which component of the black walnut tree contains the greatest concentration of juglone?" MOLLY MANCINA WINS FIRST PLACE AT NATIONAL HISTORY DAY! All Saints’ Day School student Molly Mancina ’15 was the first place winner at National History Day (NHD) in the Junior Individual Documentary category. Her project “The Rights and Responsibilities of Photojournalists: And the Ethics of Photo-Manipulation” was selected at the annual Kenneth E. Behring National History Day contest, held at the University of Maryland College Park Campus in the Washington, D.C. area June 15-19. Molly is the third All Saints’ student in four years to advance to the National History Day competition. Molly Mancina '15 is a California History Day winner! She was named California State co-champion at the 2014 NHD-CA competition for her documentary "The Rights and Responsibilities of Photojournalists," and will represent the state of California and All Saints' Day School at the National History Day Competition at the University of Maryland in June. Four of our County History Day Winners (James, Molly, Sophia and Isidoro) went to Riverside to the History Day State competition and did a fantastic job representing our school! Isidoro Cosentino '15 was also a finalist, and Sophia Davies '15 won a Monterey county recognition award. Molly is the third All Saints' student in four years to advance to the National History Day competition. Grace Deakyne won the All Saints' Spelling Bee and then represented All Saints at the Monterey County Spelling Bee at Hartnell College and finished in 4th place. Congratulations to the upper grade French and Spanish students who qualified at the National level of the National French and Spanish Contest and received their awards. The National Contest exam is offered to students all over the United States and is given as early as the 6th grade. A total of 29 All Saints' students qualified at the National level this year! Congratulations to both Olivia Myers and William Morgan, who represented All Saints' Day School at the Steinbeck Young Author Program's Day of Writing. Approximately 3,600 students throughout Monterey County participated in the Steinbeck Young Authors Program. Participating teachers read the novella The Red Pony and nominate students to represent their school in an essay contest. Both Will and Olivia are now published authors! Their essays are published in the Gabilan Journal, a collection of all of the essays written by all of the students on the Day of Writing. Additional congratulations to Olivia, who earned third place overall for all participating seventh graders. For more information, please refer to the website www.steinbeck.org. Kevin will be representing Monterey County and All Saints' at National History Day in Maryland in June. Congratulations to the upper grade French students for their outstanding participation in the French Poetry Contest which was organized by the Alliance Francaise at the Monterey Institute for International Studies this February. Students from 6th, 7th and 8th grade won 1st place in the original poems category, as well as 1st place in the recitation of poems category. Congratulations to Emilia Siletto, who won the award her essay submitted to the annual DAR (Daughters of the American Revolution) American History Essay contest. 8th graders once again did exceptionally well, winning awards in Aerodynamics/Hydrodynamics, Applied Mechanics, Cognitive Science, Environmental Engineering, Materials Science, and Product Science- Biological categories. The four first place winners will represent Monterey County at the California State Science Fair. Honor Choir and Band Awards: Nine All Saints' students were chosen by vocal audition from 243 auditions sent in from 43 music directors in the area to participate in the CMEA's Middle School Honor Choir. Two All Saints' musicians, a flutist and a trombonist, were selected for the highly competitive Honor Band. The CMEA Honor Choir, Orchestra, and Band performed at Pacific Grove Middle School on February 4th. Congratulations to our Honor Choir and Band members! The judges were “so pleased with the excellent writing quality and good command of facts” that this year there was a precedent: Helena’s and Geri’s papers were so well written that they were within one point score of each other. Since the contest rules only allowed for one winner per grade level, the official Eighth Grade Winner was Helena Guenther. However, Geri Pirkle was awarded an Honorable Mention, the first time for such an award. Congratulations to the upper grade French students for their outstanding participation in the French Poetry Contest which was organized by the Alliance Francaise and took place at MIIS in February. The students did an amazing job, winning three 1st place awards, one 2nd place, one 3rd place and two honorable mentions for original poems, as well as three 1st place and two 2nd place awards for recitation of poems. In addition, parents and other teachers commented on how comfortable our students were being on stage and speaking another language. Bravo! 8 Seventh graders won first place at the Monterey County History Day (out of a total 11 County winners)and competed at the California History Day Finals against 415 middle school students from 21 counties. Four All Saints' students were State finalists, and one was a State winner for her Exhibit, "The Great Art Debate: How the Impressionists changed the Art World forever." She also received two special awards and represented the State of California at the National History Day Competition in Maryland. Steinbeck Young Authors Festival Winner: Over 4,000 middle school students read John Steinbeck's The Red Pony and participated in the Steinbeck Young Author's Program. All Saints' sent two seventh grade finalists, one of whom received first place in the most proficient Writers category. DAR Essay Award: An eighth grade student won the DAR Essay Award for his literary work, "Paul Revere's Diaries." Art: Seventh grader, Sarah Levi, won an award in a nationwide art competition for her soft felt peace dove sculpture. She was one of just five award winners out of over 130 entries.